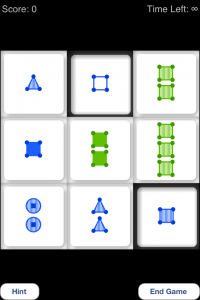 App Store description: A simple yet challenging game which exercises your brain’s “computational perception” circuitry: your ability to “notice” non-obvious relationships between objects in your surroundings. 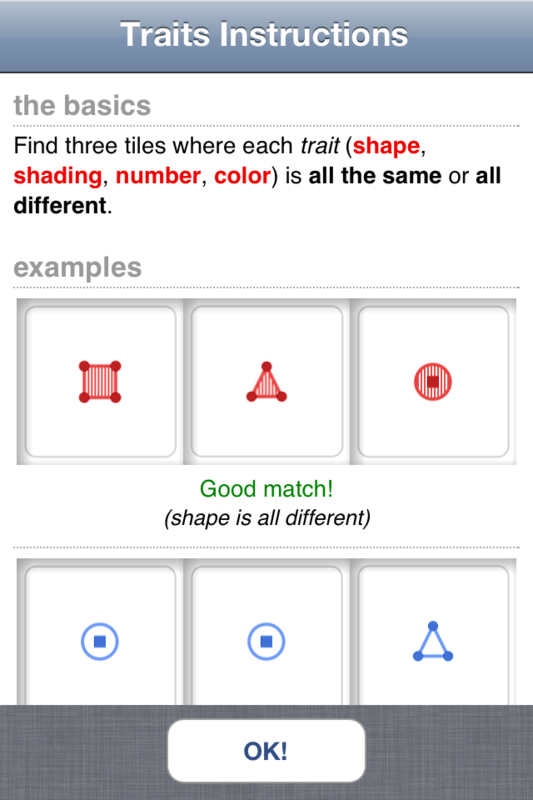 To play: Find matches of three tiles where each trait (shape, shading, number, color) is all the same or all different. Look at the examples in “Instructions” to quickly grasp the concept. Each game lasts about 90 seconds, or work with “training” mode to hone the basics. “Mind bender” mode adds a very challenging twist to the game by turning the rules inside-out! 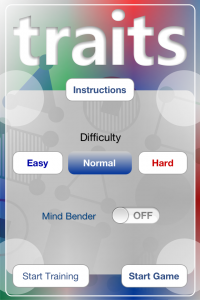 View instructions, select difficulty, and start either a 95-second game, or a training session. I recommend using Training mode to practice spotting matches so you intuitively understand the rules. The instructions have plenty of examples to explain how the game works. You may find it tricky at first, but you’ll catch on quickly. A game in “Easy” difficulty. 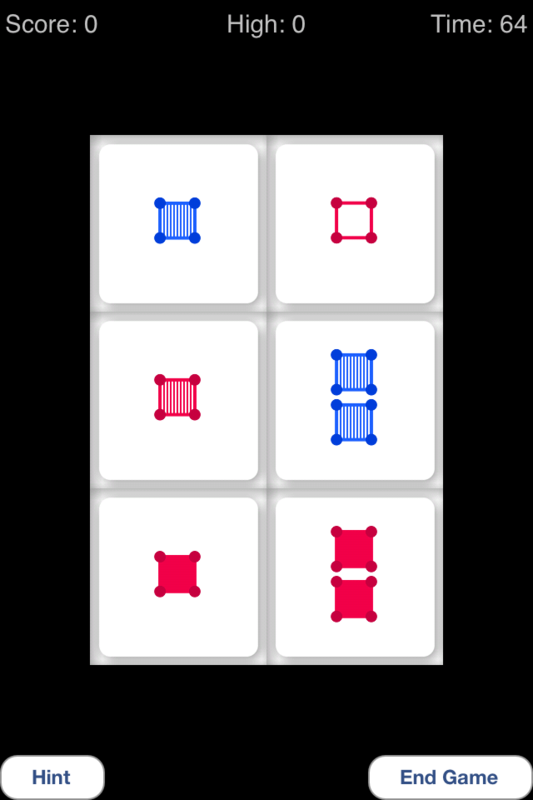 Touch three tiles which form a match. 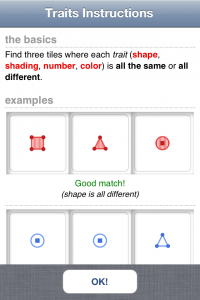 Since only red and blue tiles are on the board, and a match’s traits must be “all the same” or “all different”, the match must be either all red or all blue (since green is not available). Since only two blue cards are shown, the match must be among the red cards. 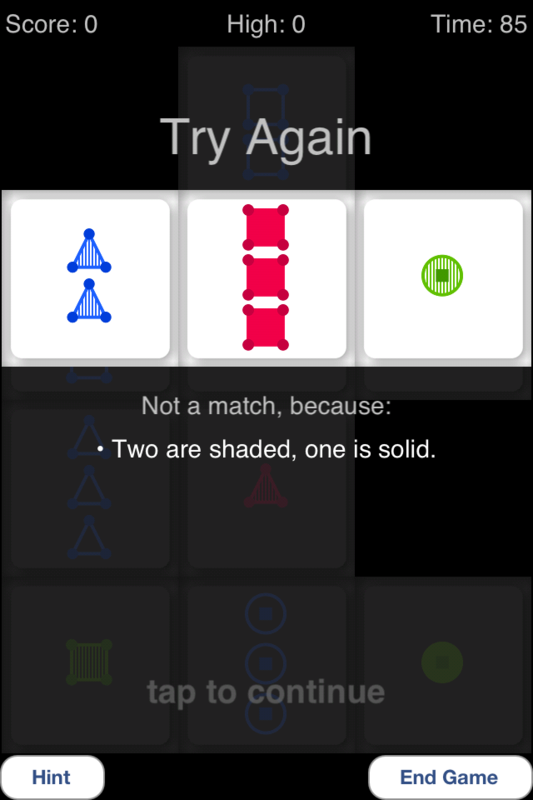 The only match, then, is the three single-square red tiles, which have all-different shadings. In “Easy” difficulty, one of the traits is always “all the same”. A training session in “Normal” difficulty. Two tiles are pre-selected, and you simply touch the third. Both are blue, so the third must also be blue. Both have one shape, so the third must also have one shape. One is clear and one is shaded, so the third must be solid (“all different” shading). Both are squares, so the third must be a square. 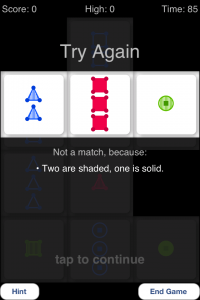 …So look for a tile with one blue solid square and that completes your match! If you make a mistake, the error screen gives a full explanation for what’s wrong with the match. There’s always at least one match on the screen at any one time. If you can’t find it, try touching “Hint”, which removes about half of the cards. The match will be among the remaining cards. Touching “Hint” for a second time selects two cards from one of the matches on the screen. Each match is one point. If you used “Hint”, you won’t get a point for finding this match. But if you’re stuck with a difficult board, “Hint” may be the way to go to get past it. If you make a mistake, you lose one point. Your highest score for each mode is recorded across gameplay sessions.